Founded in 1978, Hill Wallack LLP is a leading law firm with offices in Princeton, Cedar Knolls and Red Bank, New Jersey, Yardley, Pennsylvania and New York City. Our regional strength places us in an ideal position in today's market. With over 65 attorneys, our mid-market size allows us to provide sophisticated, high-level service to clients in a cost-efficient, responsive manner. Our attorneys are called upon to tackle some of the toughest legal and business challenges. The firm represents businesses, nonprofit and government entities, and individuals in litigation, transactional and regulatory issues. The firm also includes those skilled in family law, trusts & estates, tax liability and other areas of individual service. Do not send or include any information in any email generated through this web site if you consider the information confidential or privileged. By submitting information by email or other communication in response to this web site, you agree that the communication does not create a lawyer-client relationship between you and the law firm and its lawyers and that any information submitted is not confidential and is not privileged. You further acknowledge that, unless the law firm subsequently enters into a lawyer-client relationship with you, any information you provide will not be treated as confidential and any such information may be used adversely to you and for the benefit of current or future clients of the law firm. 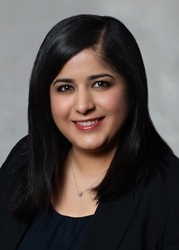 Megha R. Thakkar is Counsel in the Princeton, New Jersey office of Hill Wallack LLP, where she is a member of the firm’s Family Law practice group. Megha represents clients in all aspects of matrimonial and family law, including divorce litigation, mediation, and arbitration, custody and parenting time issues, alimony and child support disputes, post-judgment applications, marital settlement agreements, prenuptial agreements, and domestic violence litigation. She also handles complex issues of equitable distribution including distribution of businesses, stock options, and restricted stock units. She has successfully handled contested matters from inception to trial. Additionally, she has successfully handled family law matters in the Appellate Division. Megha is a qualified mediator in family law matters pursuant to R. 1:40 and has been appointed as a mediator by the Court to assist parties in reaching amicable resolutions. She also serves as a Matrimonial Early Settlement Panelist in Middlesex and Somerset Counties. In January 2016, Megha received the Martin S. Goldin Family Law Award from the Middlesex County Bar Association. The award is presented to a family law practitioner who possesses knowledge of applicable law, attempts to reach fair settlements before litigating, maintains high standards of integrity and professionalism, and demonstrates leadership in the Bar Association. To complement to her family law practice, Megha is widely involved in professional organizations. She serves as Secretary for the Middlesex County Bar Association. She is also the Chairperson of the Middlesex County Bar Association’s Diversity Committee. She is an investigator appointed by the Supreme Court of New Jersey to the District VIII Ethics Committee. Additionally, Megha is a member of the Young Lawyers Committee for the New Jersey State Bar Association Family Law Section and a Barrister for the Aldona E. Appleton Family Law Inn of Court. Megha is also a member of both the South Asian Bar Association of New Jersey and the Asian Pacific Lawyers Association of New Jersey. Additionally, Megha was selected for inclusion on the list of New Jersey Super Lawyers Rising Stars for Family Law, in 2014, 2015, 2016, 2017, and 2018. Prior to entering private practice, Megha served as Judicial Law Clerk to the Honorable Andrea G. Carter, J.S.C., in the Superior Court of New Jersey, Family Part, Middlesex County. Megha is admitted to practice in New Jersey (2008), United States District Court for the District of New Jersey (2008) and New York (2009). She earned her J.D. from St. John’s University School of Law, where she was a St. Thomas More academic scholar and named to the Dean’s List. She also served as President of the South Asian Law Student Association and was a member of the Moot Court Honor Society. She earned her B.A. from New York University. Megha is fluent in Gujarati.